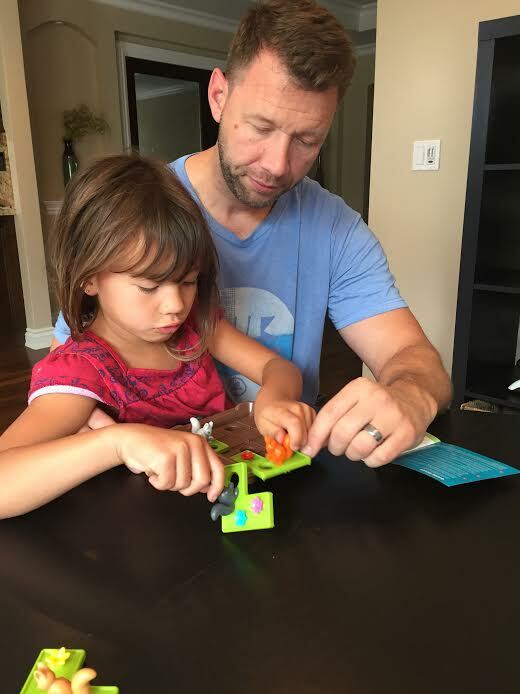 As summer quickly approaches, I’m looking for ways to keep my kids entertained without having to spend a lot of money or give them electronics. Letting them play outdoors is always a great option. But to be honest, there’s only so much time they can be outside before they get overheated in the hot weather. My kids are the ages where they are very interested in board games (6 and 7 years old). We have played a few board games over the last year, but none of them really have challenged my kids beyond counting the dots on a dice. So, when a friend of mine introduced me to Smart Games earlier this year, I was thrilled. The games were fun and interesting, yet challenging at the same time. 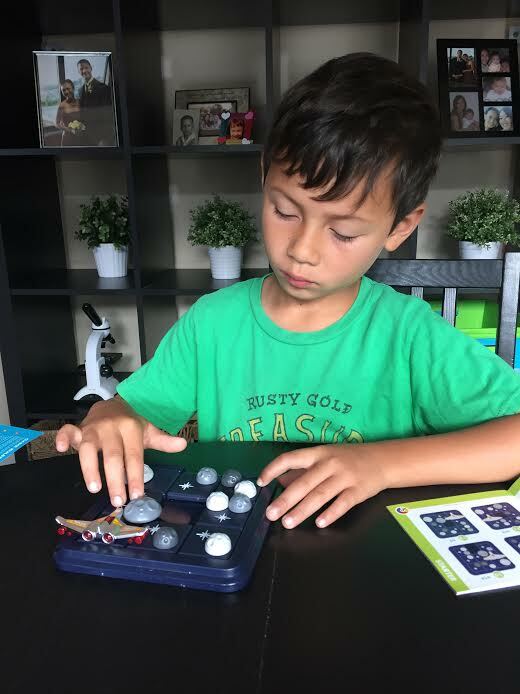 By now, both of my kids are familiar with Smart Games and love the few that they have played with. This month we tried three more Smart Games: Asteroid Escape, Squirrels Go Nuts, and IQ Focus. And like before, the Smart Games did not disappoint! The idea behind Asteroid Escape is simple: navigate your spaceship through the asteroid field and off the board. To begin the game, you place the 8 puzzle pieces on the board and move each piece one by one. 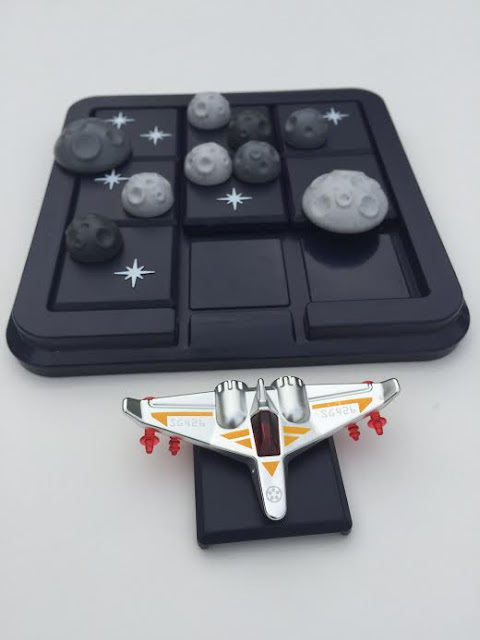 You finish a challenge when your spaceship successfully escapes the asteroid field and fly off the game board. 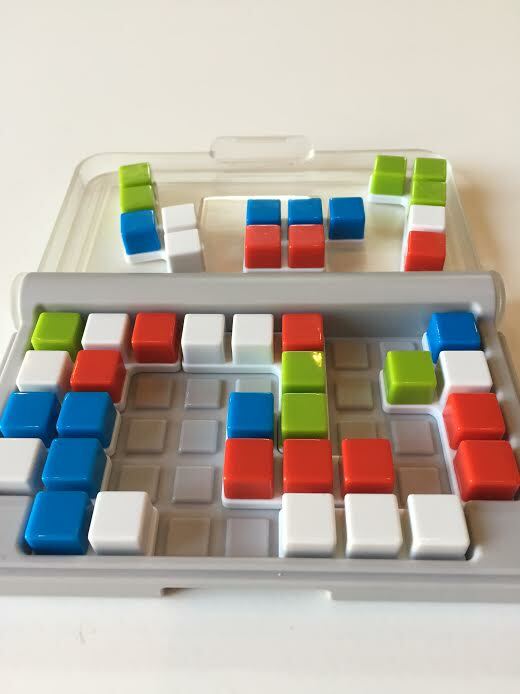 Though the concept is simple, this single player puzzle game takes some careful thinking and strategizing. 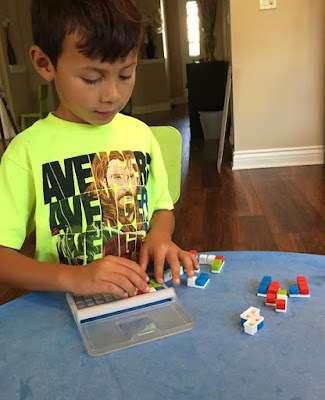 Trial and error only got my kids frustrated and often resulted in the pieces back in their starting position. However, when my kids took the time to think about the challenge’s goal, they were able to navigate the spaceship out of the asteroid field a lot quicker. 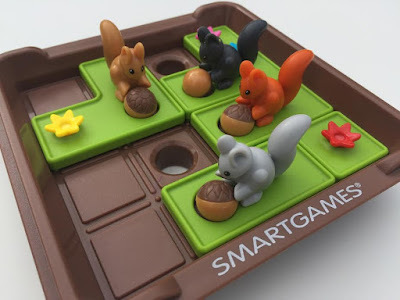 Like Asteroid Escape, Squirrels Go Nuts is another single player, sliding puzzle game where players slide one piece at a time. The goal of the game is to help the squirrels prepare for winter by hiding their acorns underground. You complete a challenge when all squirrels have dropped their acorn into a hole. My kids thought the squirrels, the rattling acorns, and the flowers were the cutest things. Since my daughter is the nurturing type, she really wanted to help the squirrels get ready for the winter. Like Asteroid Escape, trial and error can only get you so far with this game. You will get a lot further with logic and reasoning. For example, when a squirrel dropped its nuts in a hole, another squirrel could move over it to get to a space they couldn’t before. 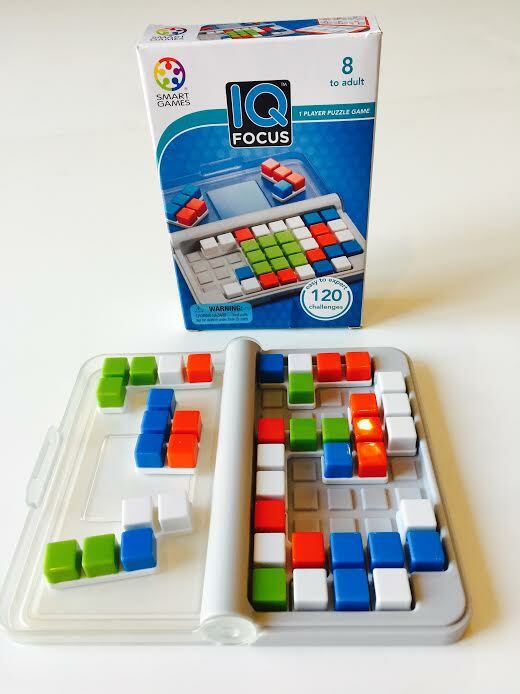 IQ Focus reminds me of a game I used to play as a child, Tetris. It consists of a small, compact box and 10 3D puzzle pieces. Like the other two games, there are different challenges of varying levels. The object of a challenge is to fit all pieces on the game board so that the 9 center squares match what is shown in the challenge. My son and I worked on the first few challenges together. He soon picked up the concept and was able to play by himself. 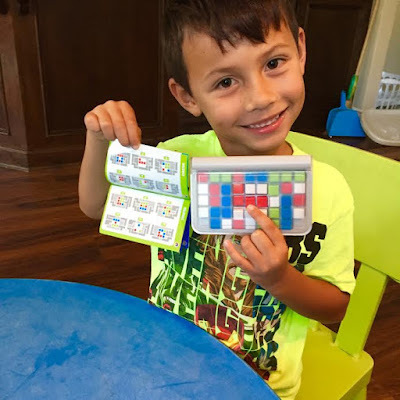 During the next few days, I was constantly impressed as he periodically came up to me with a proud smile after he completed a challenge on his own. As I mentioned, this wasn’t our first time with Smart Games. All three games we played with this time were fun and interesting. All of them had many challenges of increasing difficulty. This kept the kid’s interest in the games. It’s tempting to skip levels, but I found that it’s beneficial to do the challenges in order. Many challenges build on the concept and strategy learned from a previous challenge. As summer approaches, I predict that these games will be played with a lot by my kids. Since the games are compact and came in their own cases, it will be easy to take these games on road trips, camping trips, or play dates. The small size also makes it easy to clean up and store too. The game’s prices range from $9.99 to $18.59 on Amazon. With these reasonably prices, I don’t have to worry about breaking my budget to keep my kids entertained and stimulated over the summer! One Winner will Receive Choice of Game Above! Looks like these games would make great gifts! !